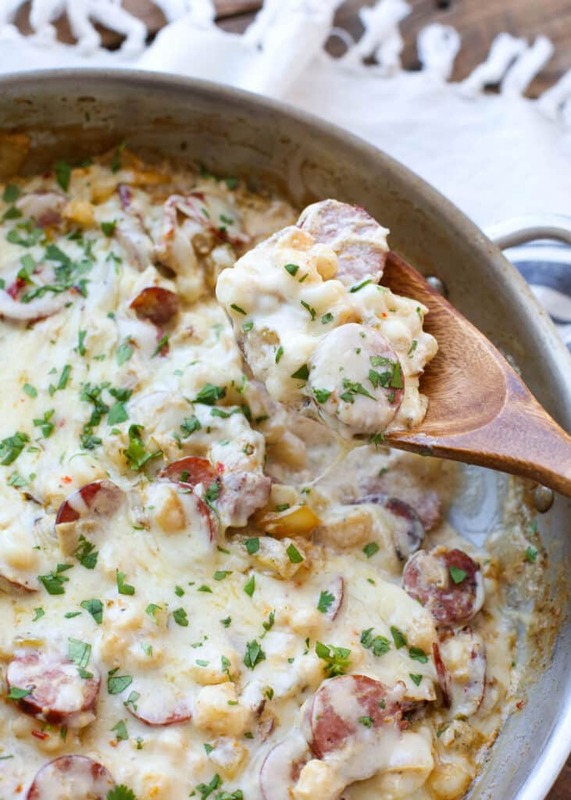 Soft, chewy hominy is baked in a creamy sauce along with plenty of spices, green chile, and kielbasa to make this Creamy Hominy Casserole. The meal comes together with about ten minutes hands-on time and then it’s tucked into the oven where it will simmer away on its own until the hominy is soft and chewy and everything is bubbling hot. Last week, I had the opportunity to travel with Certified Angus Beef (C.A.B.) to visit a cattle ranch in Kansas. 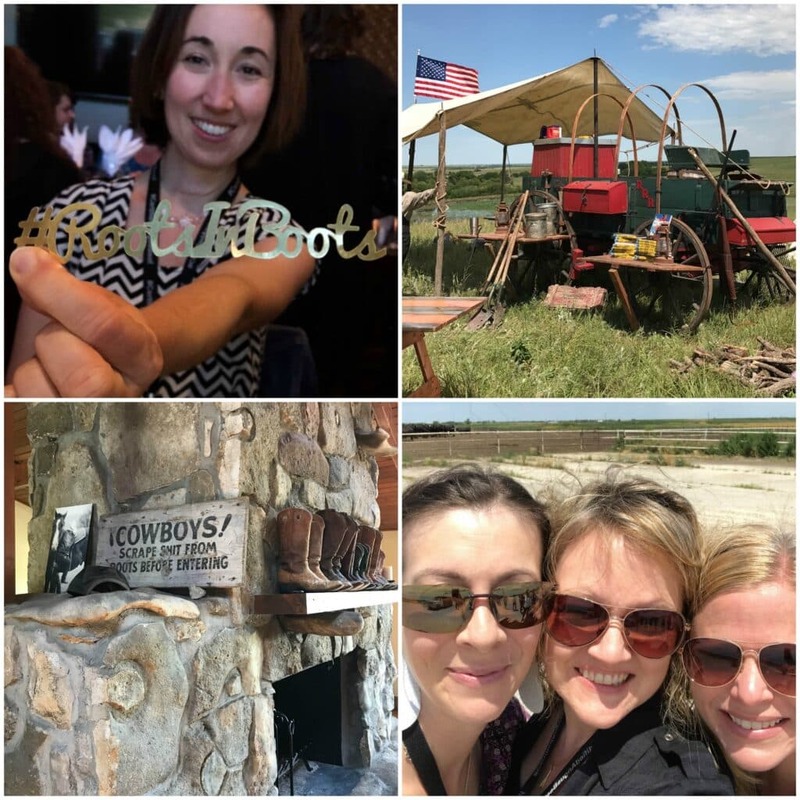 It was a once in a lifetime experience complete with a chuckwagon dinner on the prairie, cowboys, cattle, and no end of laughter and conversation. The ranchers’ love for the land, their families, and the animals was evident in every aspect of their lives. 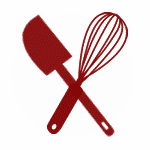 I started writing this post with a great recipe in mind to share with you, but there is still so much on my mind that I want to tell you about more of it. This is not a sponsored post. I simply remain overwhelmingly impressed with my peek into the cattle industry and the love of the land that was evident in everyone I met. I want to share my experience with as many of you as I possibly can. I’ve been home a week and I haven’t stopped running my mouth off to friends and family yet. If it were possible to repeat my time in Kansas, I would do it in a heartbeat. You may recall that a couple of years ago, I visited C.A.B.’s culinary center in Wooster, Ohio. We worked in the test kitchen and created some mouthwatering recipes, including this Southwestern Crusted Roast Beef. I learned a great deal about the different quality levels of beef and the standards that are required in order for beef to be certified. When my friends at C.A.B. asked if I would like to go along with them to visit a cattle a ranch, I jumped at the opportunity. I’ve been dreaming of a ranch visit for a couple years now, so this was literally a dream come true for me. I knew the trip would be fun, but I had no idea that my peek into the workings of the cattle ranch would be such an amazing experience. We spent Saturday out on the Blythe ranch in rural Kansas. Debbie Blythe hosted us for lunch and then we toured Tiffany Cattle Company. The science, the technology, the sheer enormity of the operations for both the ranch and the feedyard was mind-boggling. 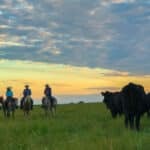 We hear so many buzzwords nowadays, about our meat supply, and about our food supply in general; it was really neat to experience a small part of the story behind the cattle there in Kansas. The diet that the cattle are fed at the Tiffany family’s feedyard is so precise, it puts any diet you or I have ever tried to shame. 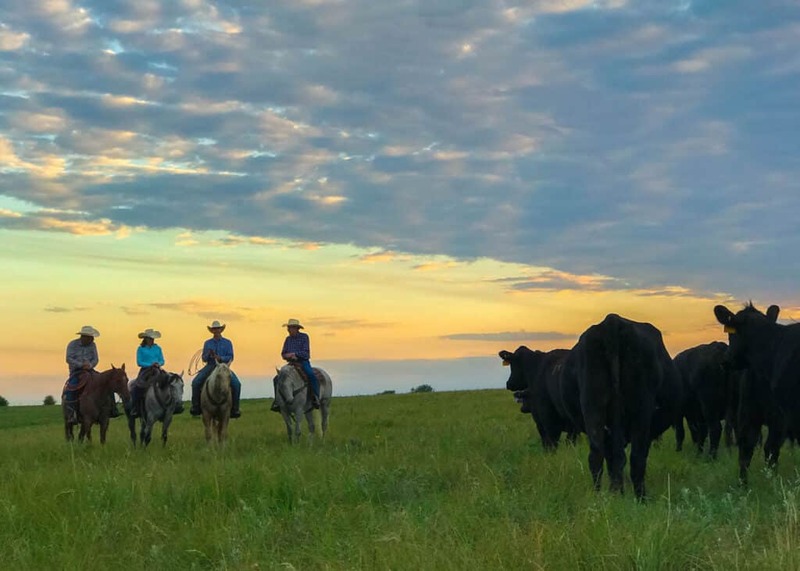 Debbie shared her definition of sustainability with us: “take care of the land, take care of the people, take care of the animals, and make money.” Despite the fact that these ranchers obviously love what they do, in the end, if you aren’t making money, no business is sustainable. I loved seeing how much these ranchers love what they do and to hear how fortunate they feel to be able to do it. We were treated to a chuckwagon dinner cooked by Cowboy Kent Rollins and his wife Shannon. There aren’t enough superlatives available to describe just how great our meal was. The dinner was centered around tomahawk steaks (a.k.a. 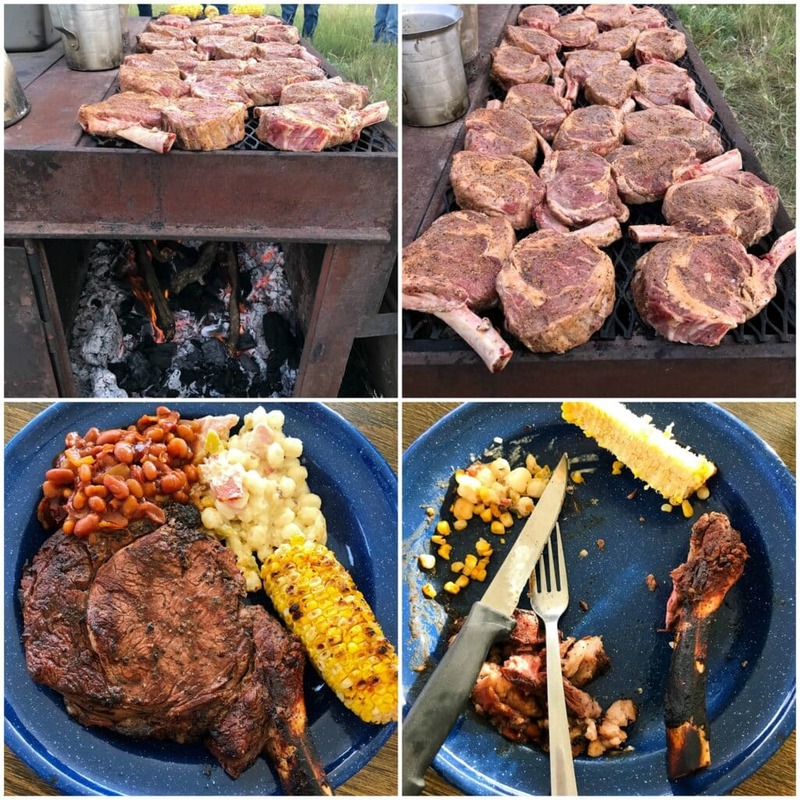 cowboy steaks) that were cooked to absolute perfection. There was no way I’d be leaving a bite of that meal behind. Who knows when I’ll have the opportunity to eat another steak of that caliber? So, I will tell you now that it was amazing to the last bite. Creamy Hominy with Green Chile was one of the sides served alongside those steaks. 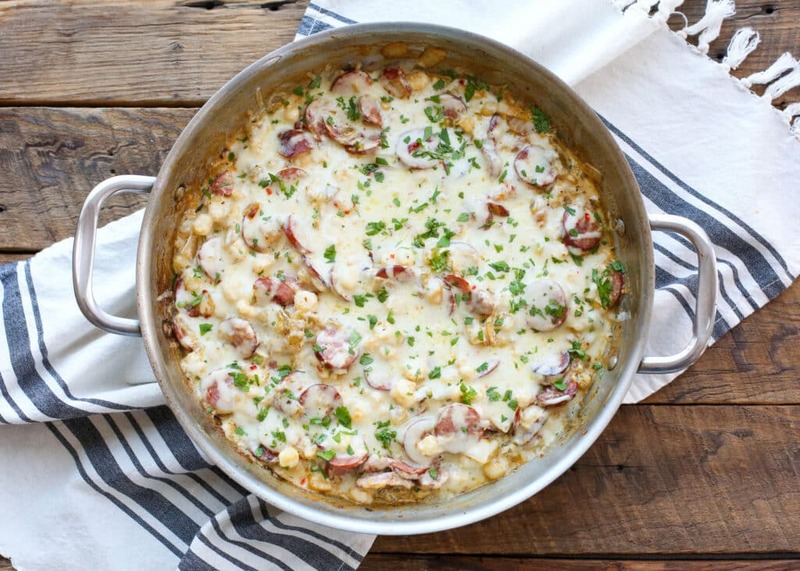 As soon as I took a bite, I looked at Rebecca and said, “Oh yeah, this needs to be shared on the blog.” Even if you aren’t already a fan of hominy, I challenge you to try this dish. Prior to this, the only recipe I’ve ever used hominy in is New Mexican Posole. While we enjoy posole every holiday season, this dish is completely different. My intention was to share Cowboy Kent’s recipe with you, straight from his cookbook, however, I’ve never really been one to leave well enough alone. I’ve added a sprinkling of extra spices, doubled down on my beloved green chile and added a pound of kielbasa sausage to make a full meal of it for my crew. If you’re like me, and posole is your only point of reference for hominy, you really need to try this. Preheat the oven to 350°F. Slice the kielbasa as thinly as possible, about 1/8-inch thick pieces, if possible. Chop the onion. Warm the oil or bacon grease in a large stainless skillet over medium high heat. Add the sausage and the onion. Cook, stirring frequently, until the sausage and the onions are lightly browned, about 4 minutes. Remove from the heat. Add the hominy and green chile to the kielbasa and onions. Stir to combine. Add the sour cream, salt, pepper, cumin, and cayenne to the skillet and stir to mix well. Bake for 30 minutes, until hot and bubbling. Remove from the oven, stir well, and sprinkle with cheese. Bake 5 more minutes until the cheese has melted. Serve hot. Enjoy! As we ended our day on the Prairie, complete with a beautiful sunset, cowboys in the distance, and cattle lowing nearby, I felt like I was standing on the pages of a Zane Grey novel. The beauty of that moment and the palpable love that these people have for their world was enough to take your breath away. To see what goes into getting that cattle from gate to plate was an experience that I will never forget. I spent just four days in Kansas, but I feel as if I brought part of it home. I have learned so much and I want to share as much of it as I possibly can with you. 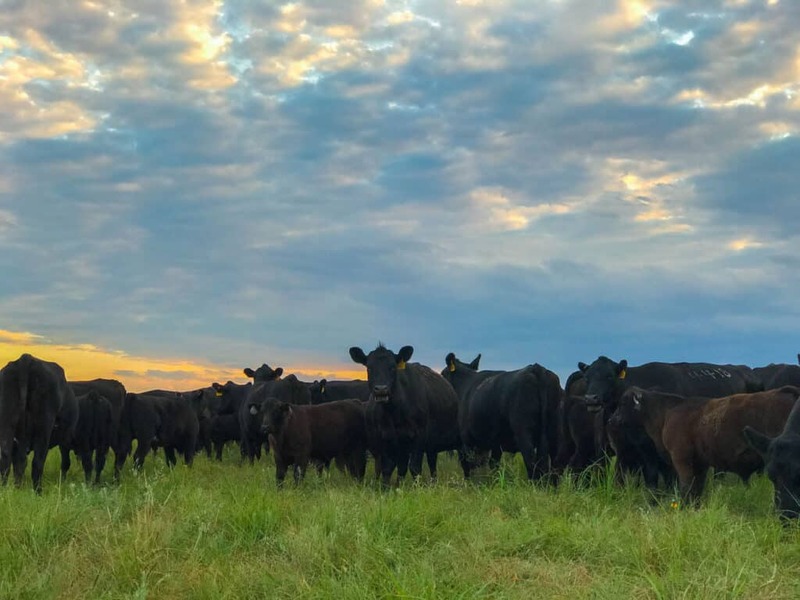 If I was not already the world’s biggest fan of Certified Angus Beef simply for the quality of the meat on my plate, I would be now after getting to know the brand and the people even better. The people that work the ranches and care for these animals are my kind of people. Their love for family and their love for the land defines them. Giveaway ends Sunday, July 9, 2017 at 11:59 EST. No purchase necessary. Must be 18 years of age or older and a resident of the U.S to enter. 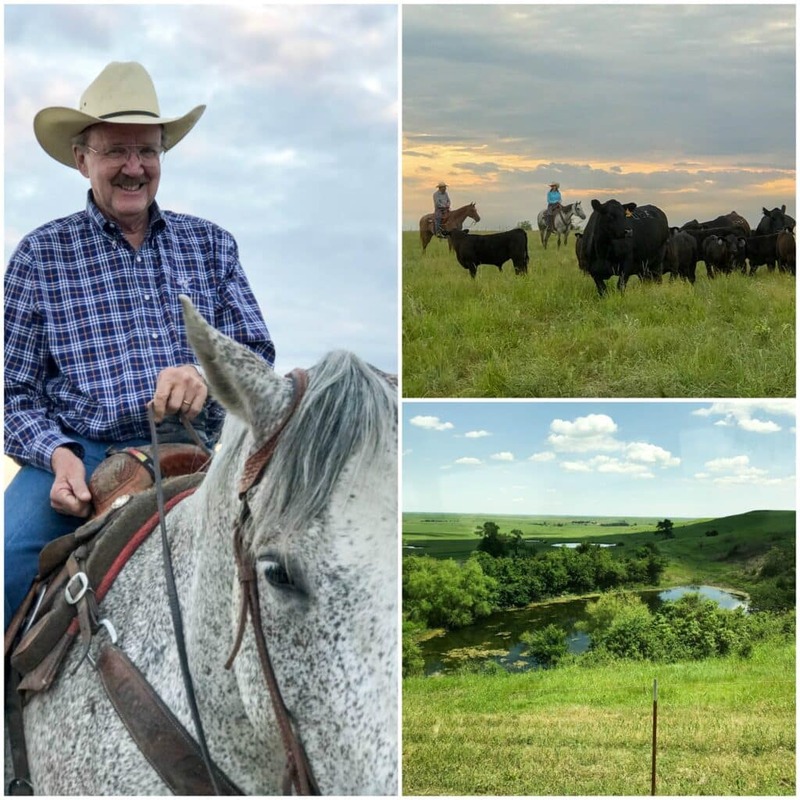 This giveaway is sponsored by Barefeet In The Kitchen as my way of sharing my cattle ranching and day on the prairie experience with you. I would make the world's greatest FRIED CHICKEN, Then I'd make the world's greatest CHILI. I would make a gorgeous Pot Roast w/Yorkshire Pudding! This is a perfect time of year to make a big pot of baked beans for summer cookouts. And in this Dutch oven, they could be cooked on the stove top, the oven, or on the campfire! Thanks for this great giveaway, Mary! Our family loves camping in the mountains, we have made wonderful friends over the years & often share meals with them all, we all camp together during the summer, our children have grown up together camping & now their children are making the same wonderful memories together. I would be making a huge pot of ranch beans over the fire in this pot. Enough to serve 20 friends & family. Made a version of this last night and it was so good!! Didn't have any green chilies, so used 1/2 cup salsa verde and then just 1 cup sour cream. Also only had cheddar cheese. Whole family loved it.